Nvidia is about to announce its new top-of-the-line GeForce 8-class mobile GPU, the 8700M GT, after briefing the Japanese media today. Nvidia's GeForce 8700M GT: the 8600M GT overclocked? The new chip is essentially a higher-clocked 8600M GT: both GPUs contain 32 unified shader engines - Nvidia calls them Stream processors - but while the 8600M GT is clocked at 475MHz, the 8700M GT runs at 625MHz. The two chips' memory banks are clocked at 700MHz and 800MHz, respectively. The new, enthusiast-oriented chip has a texture fill rate of ten billion texture elements per second to the 8600M GT's 7.6 billion. Nvidia quoted big performance gains over the old GeForce Go 7900 GS, but a more apposite comparison would be with the 8600M GT and 8600M GS, but we'll have to wait for independent testing before we can workout which of the three chips offers the best price:performance ratio. Both GPUs connect to 512MB of GDDR 3 graphics memory over a 128-bit bus. 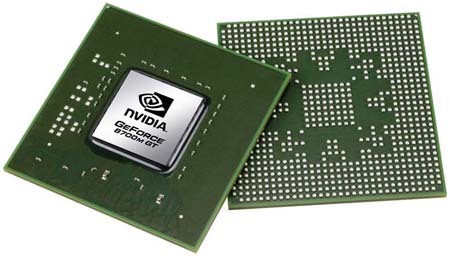 However, Nvidia said the 8700M GT's bus is configured in a "dual-rank" mode. It has bandwidth of 25.6GBps - the 8600M GT's is 22.4GBps.